From our pal Robert Burns At Sound Off Louisiana comes a bit of video from yesterday’s Baton Rouge Press Club gathering, during which Louisiana Gov. John Bel Edwards was asked to comment on statements by Rep. Alan Seabaugh (R-Shreveport) regarding the state’s budget situation. No, the questioner of Edwards is not a member of the media. That’s Louis Reine, who heads the AFL-CIO in Louisiana. To say that Reine’s question is a softball is a wholly insufficient description. Yes, that was a planted question – in case you might be a bit slow on the uptake. And yes, you’re entitled to be turned off by the rather blatant abuse of a press conference in order to push the governor’s narrative. Edwards’ contention is that he’s made some $600 million in cuts to Louisiana’s budget, and goes further to state that any further cuts to the budget would be devastating to the services the state provides. He’s gone even further in predicting that if the legislature doesn’t pass a billion dollars in tax increases to replace the 2016 sales tax hike slated to come off the books this year Louisiana won’t actually have a budget, because the legislature won’t vote for a budget as hollow as it would need to be to balance. Any objective analysis of those claims wouldn’t be favorable to them. The fact of the matter is that Edwards inherited a budget from Bobby Jindal which was around $25 billion. You could make the argument, and if you did you wouldn’t be all that convincing, that Jindal’s budget underfunded lots of state agencies – you’d have to explain why none of the state’s services were shut down, why TOPS was fully funded, why the cops still got their supplemental pay and the local school districts still got their Minimum Foundation Program money, etc. – and so on. But today Louisiana’s budget is $29.6 billion. It’s true that most of the increase comes from the fact Edwards unilaterally expanded Medicaid in Louisiana, adding almost 450,000 people onto the rolls of government dependency in the process and dragging in federal dollars to expand the budget. In Edwards’ thinking that actually saves the state money because some of those people had been covered through the indigent health care budget, but time isn’t likely to be kind to such a forecast. But even if you believe most of the growth comes from Medicaid, Edwards raised the better part of $2 billion with sales tax increases. Only about half of that covered the budget deficit he claimed he was inheriting. Which means the rest grew the state budget. It’s really amazing that Edwards would be picking this fight, for two reasons. First, a governor doesn’t allow himself to be dragging into a shouting match with a state legislator who isn’t Speaker or at least a committee chairman. Seabaugh, as fond as we are of him, is none of those. This is a classic case of “punching down,” and it does a lot more to elevate Seabaugh’s stature than it serves Edwards. And second, nobody is going to be convinced that Edwards has actually cut Louisiana’s budget when all they see is that Louisiana now has the highest sales tax rates in America when that wasn’t true before he took office. Even if the governor’s people can find a way to square his statements with some version of the truth, it still won’t pass the smell test with the voters who are paying attention (admittedly, based on the turnout figures from last fall’s election, those paying attention constitute a small part of the public). Why allow yourself to get dragged into a losing argument? The answer being that if Edwards accepts the truth that he’s increased Louisiana’s budget while raising taxes, he has a very weak argument against the legislature doing nothing and allowing those tax increases to expire. As Jeff Sadow ably explained yesterday, Edwards is at the mercy of the House of Representatives should Speaker Taylor Barras decide to sit on his hands. However, in a recent media interview, Barras would not let Edwards off the hook. He realizes the emptiness of the threat not to call a special session, for two reasons. Most obviously, the Legislature doesn’t have to depend upon the governor to convene it, as it has the power to call itself into special session. For example, with the regular session commencing on Mar. 12, the special session could begin on Mar. 5, with the call petition completed by Feb. 26 – more than a month after Edwards’ deadline. Better, this call can include spending reform measures Edwards unlikely would embrace. The only fly in the ointment to this move comes with Republican Sen. Pres. John Alario’s fealty to Edwards. Yet given the choice between increasing the chance for chaos just until the start of next fiscal year and forcing Edwards into an unpalatable budgetary position, chances are Alario would go along with joining in a call, which a majority of legislators can trigger. Because if no such session is in the offing by Jan. 26, Edwards must present a budgetwith large expenditure cuts. Anything he produces makes him a target for criticism, and without a way to qualify what he will produce by appending to any discussion of that document changes that would occur as a result of an imminent special session, he will bear the full brunt of negative reaction, even if he yelps often that others should bear blame for not acceding to his tax hike wishes. Hence, he chose a deadline a week ahead of time so he could work that into budget appendices. To his credit, Barras appears unconcerned about bullying tactics designed to hand Edwards a political victory. Further, he seems to understand that he can use this issue to trap Edwards into a nightmare scenario for the governor’s agenda – not permanent tax increases largely on corporations and on income, but permanent spending reductions with no tax increases or, as a fallback position, in sales tax rates. Edwards desperately wishes to avoid this one kind of tax hike, because while it would cause those above lower class will pay the most by far, lower-income households will pay a greater percentage of their earnings that way. If he accepts this, Edwards gets tagged, even in an oversimplified fashion, as the governor who raised taxes on the poor. What Edwards has to do, and he’ll have the help of the state’s legacy media in this mission, is to paint a picture of a lean state budget with no room for cuts – if there are cuts disaster will loom, and the Republicans in the House will be at fault, so taxes must be raised in order to “save” Louisiana. He has to push that narrative, and he has to win the PR war over it. Because if he loses, Barras and the House Republicans can merely do nothing and force him to make some $900 million in cuts to the state budget. And despite the expected “Washington Monument strategy” to come, in which those cuts will be made in the most painful, high-profile ways possible, most of them will nevertheless be harmless to the public. We’ve said that Edwards’ supposed 65 percent approval rating reflects support which is a mile wide and an inch deep. Depending on how much the state’s voters are actually paying attention over the next couple of weeks, that number will be tested, and greatly. 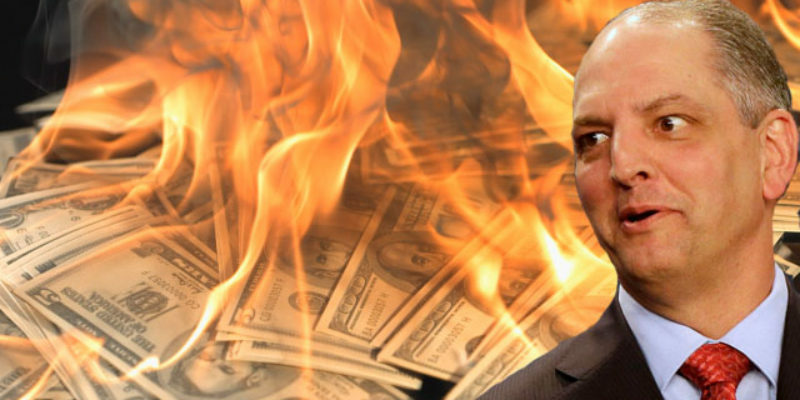 Next Article AGUILLARD: Did Lamar White Fleece His Donors With The Bayou Brief?